A victim of a vicious torturer escapes and ends up in an emergency room in Atlanta. 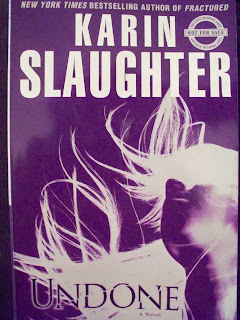 It is here that three characters from previous Karin Slaughter works cross paths. Sara Linton from Faithless plus Will Trent and Faith Mitchell from Fractured each take a distinct path in helping this woman known only as Anna. As the characters relate memories from their past to the case, conflict and new relationships arise. As a new deadline looms the characters are forced to work through their personal issues and catch the culprit before more women are seriously injured or tortured. Tensions rise with each dead end. The suspense builds within the reader as each suspect manages to be cleared only to be brought back into the light. Slaughter is able to truly make this a mystery. In the end the reader will enjoy this mystery and may be surprised at the final climatic scenes. The detail Slaughter uses pulls the reader into the horrifying crimes. A sense of dread creeps up on the characters and readers with each new development of the case. It was hard to put down this book because the action was non-stop. The depth of the characters was a welcome surprise. This reader was left wanting more of the characters and is hoping for another book where these three reunite.